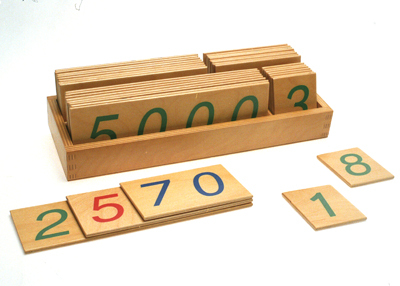 Staple piece of Montessori equipment that can display every number from 1 to 9999, and how each of these numbers is formed from units of ones, tens, hundreds and thousands. This larger version is more visible, and is designed for use by teachers in conjunction with the "1 to 9000 Small" used by the students. It comes with its own specially designed storage box. The product includes the numbers 1 to 9 on individual boards. It also includes the numbers 10 to 90 in increments of ten (ie. 10, 20, 30) on individual boards, and does the same for the numbers 100 to 900 and 1000 to 9000. The teacher can form any number up to 9999 from these constituent boards and, after asking the child to identify it, can show them how it breaks back down into these constituents. -screen-printed on birch plywood with a lacquered finish for easy cleaning. -includes 36 separate number boards: the ones (1 to 9), the tens (10 to 90), the hundreds (100 to 900) and the thousands (1000 to 9000) and storage box.